Borussia Dortmund suffered a disappointing first-leg defeat at home to Red Bull Salzburg in the Last 16 of the UEFA Europa League. The visitors from Salzburg started the game well and truly on the front foot in Dortmund, though the first chance of the game still fell to Andre Schürrle at a corner, but the German could only volley his effort over the bar. Few real chances followed during the opening 45 minutes which saw momentum ebb and flow, but the best chance of the half did fall to the Austrian side when Roman Bürki denied Hee-Chan Hwang from close range before Marcel Schmelzer cleared Munas Yabbur’s rebound off the line just minutes before the break. The second half got off to the worst possible start for Dortmund as Salzburg were awarded a penalty after Ömer Toprak pulled back Hwang. Kosovo international Valon Berisha stepped up to convert and put the visitors ahead. The lead was doubled less than 10 minutes later when Berisha again smashed home a cut-back to the edge of the box, leaving Borussia in all sorts of trouble. 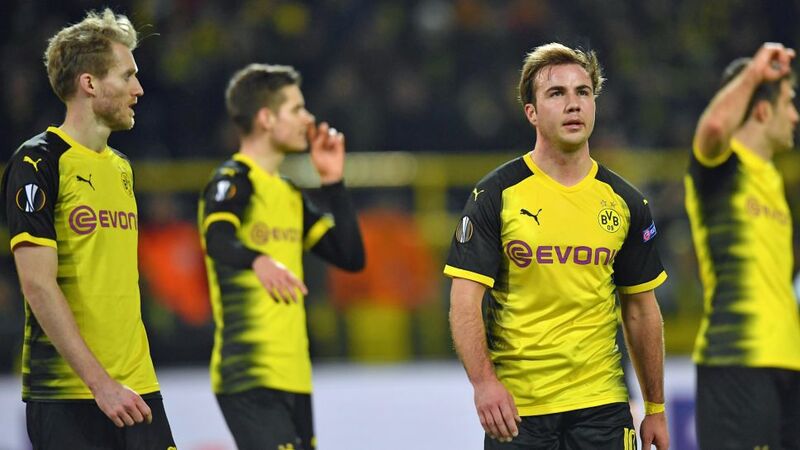 Peter Stöger responded by throwing on Maximilian Philipp and Christian Pulisic, and the latter had an immediate impact as just seconds after coming on he crossed for Schürrle to bundle home and reduce the deficit to one. BVB pushed for that equaliser in the closing minutes but failed to find a way past a stubborn Salzburg defence and Dortmund will have to overturn this loss in Austria next week if they want to reach the quarter-finals of this season’s competition. Dortmund - who have reached the last eight in Europe in three of the last four seasons - had won all four of their previous games against Austrian opposition.Their most recent clash against an Austrian side was a 5-0 win over Wolfsberg in the Europa League third qualifying round in August 2015. Reus opened the scoring, before a goal from Pierre-Emerick Aubameyang and a Henrikh Mkhitaryan hat-trick.BVB have only won one of their last 11 European games (D3, L7), losing four of their last six at home.Salzburg won their Europa League group for the fourth time this season, a competition record.Red Bull have played nine games against German opposition, resulting in three wins, two draws and four defeats. This was their first victory on German soil though.The Austrian Bundesliga leaders are now unbeaten in 18 European games (W11, D7), including 10 on the road (W5, D5).